A new 50-knot robot boat has successfully completed its first sea trials and could prove a crucial security device for superyachts. The Hydra is an unmanned surface vessel, or USV, and is the result of a partnership Abu Dhabi-based Al Seer and marine robotic specialist 5G International. The sea drone was exhibited at the International Defence Exposition in Abu Dhabi after successful sea trials in the UAE earlier this year. The USV has inflatable tubes similar to a rigid inflatable boat (RIB) design, is 4.26 metres long with a beam of 1.5 metres and 0.3-metre draft. Just 400kg, it is steered by a waterjet powered by a 1.8 litre, 4-stroke Yamaha engine. Top speed is 52 knots. 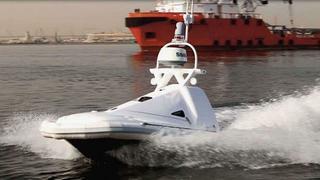 It is equipped with a broadband (FMCW) radar, forward-facing sonar and a low light/IR video camera. The drone is designed as a security device, ostensibly a harbour patrol vessel, but it can be carried by larger yachts and deployed as an unmanned surveillance boat for superyachts at anchor or in harbour, by day or night. Powered by batteries, it can patrol for around 21 hours. The surveillance equipment on board can detect submarines and other incoming vessels and can be linked to other USVs within a network to create a secure field of waterborne sentries around a superyacht. CEO of 5G International Robert Murphy, who is considered the father of unmanned robot boats, or roboats, after patenting the initial concept in 1986, said one private superyacht owner had already acquired a Hydra. Hydra is the latest is a long line of prototype and concept models and currently 5G International has seven models in its USV programme. These range from fast RIBs, to remote helicopter platforms, to remote fuel barges, to military-spec boats that can be operated manned or unmanned for fast insertion of troops.